The most versatile insulation. Spray foam provides high R-value insulation, while also sealing air leaks and serving as a moisture barrier. Here it’s been applied to stone foundation walls and ductwork. There’s no such thing as the perfect insulation, but spray foam insulation comes pretty close, especially in challenging basement and crawl space applications. Although it’s more expensive than most other types of insulation, spray foam (technically known as Spray Polyurethane Foam, or SPF) delivers extra value that many home and business owners have come to appreciate. We use closed-cell spray foam called POLARFOAM 7300, a Canadian-made product supplied by a leading Canadian SPF company. Our technicians are trained to use our industry-leading application equipment safely and effectively. …an all-in-one system that seals air leaks, prevents moisture penetration, and provides insulation value. …super-sticky, so that it adheres firmly and permanently to any material it contacts. …stable. It won’t degrade, compress or lose R-value like fiberglass insulation can. …high in insulation value: at least R-6 per in. of thickness. …made using recycled plastics and vegetable oil. We recommend applying closed-cell spray foam to the rim joist area in basements and crawl spaces. This application prevents air infiltration in a very leaky part of the building. SPF can also be used to insulate foundation walls –especially walls that have an irregular surface (stone walls, for example). By applying spray foam to air ducts in your HVAC system, the ductwork can be sealed and insulated in a single step. 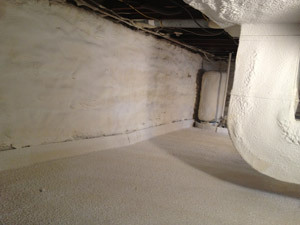 Advanced Basement Systems is your local basement and crawl space spray foam contractor in Ontario. Contact them today for your Free Estimate for ON spray foam insulation installation. 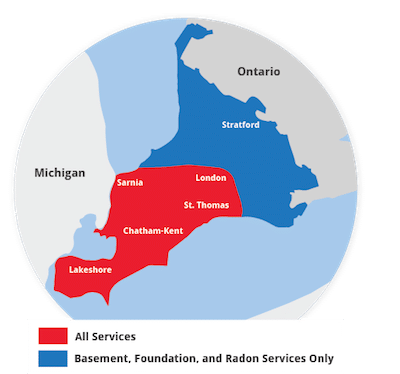 We proudly serve Chatham, London, Windsor and nearby areas such as St Thomas, Stratford, Sarnia, Wallaceburg, Amherstburg, Strathroy, Leamington, Ingersoll, Kingsville, Aylmer, Goderich, Essex, Hanover, Listowel as well as the surrounding areas of Ontario.